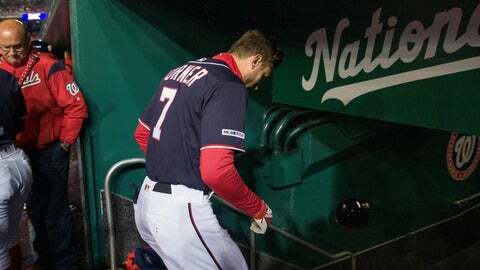 WASHINGTON (AP) — Starting shortstop Trea Turner has been put on the 10-day injured list by the Washington Nationals with a broken right index finger. Wilmer Difo took Turner’s spot in the infield for Washington’s game against the Philadelphia Phillies on Wednesday. Second baseman Brian Dozier was moved up to bat in Turner’s No. 2 spot in the lineup. To replace him on the 25-man roster, the Nationals recalled infielder Adrián Sanchez from Triple-A Fresno. With Washington’s new top minor league affiliate based on the other side of the country, Sanchez left Tuesday evening, flew from California to Chicago, caught a connection, and landed in Washington on Wednesday morning. The Nationals plan to active utility player Howie Kendrick off the IL on Thursday, when Washington opens a three-game series at the New York Mets. Matt Adams, who left Tuesday’s loss with back spasms, could be available to pinch hit Wednesday.